UNITED STATES: Fasten your seat belts -- it will be a bumpy ride. The domestic US wind market has entered a period of unprecedented boom as turbine makers and developers scramble to beat market uncertainty due to the possible expiration in December of the country's most significant financial incentive. The production tax credit (PTC) supports construction of new wind projects and there had been a chance that during February policymakers would extend the pivotal policy along with the less-important investment tax credit (ITC). This failed and action on both is now unlikely until late in 2012. Also dogging the wind industry has been political gridlock in Washington DC, November's upcoming federal elections, sagging electricity demand, ballooning national debt and natural-gas prices far below those in Asia and Europe. The US also remains the only mature, major wind market without a coherent, long-term, national energy plan. Widespread denial of climate change is a major political factor, too, in the world's largest electricity market. At the year's outset, analysts were predicting that new wind capacity installed during 2012 could reach 9-9.7GW - or even higher. This would be around 40% up on 2011. Dan Shreve, director at renewables consultancy Make Consulting, says: "(2012) will be a very successful year. We'll see a tremendous demand bubble, then it will burst and we'll have a hangover in 2013, a substantial downturn even if the PTC is extended." When the PTC lapsed previously, as it has four times, wind installations dropped the following year by a staggering 73-93%, according to the American Wind Energy Association (AWEA). For 2013, analysts project that installations could tumble to 2GW, or possibly even down to less than 1GW. In 2014, recovery to 4GW is expected, provided the PTC has been extended for two years. Late 2011 saw a substantial number of construction starts, in order to comply with the December 2011 deadline to convert ITC payments to cash through government funding, known as Section 1603 grants, equivalent to 30% of project costs. Tax-equity financing is likely to remain readily available until August or September this year when the bust should begin, according to Amy Grace of Bloomberg New Energy Finance (BNEF). In January, tax equity's price was already rising slightly, notes Ed Zaelke, co-chair of the global project-finance and renewable-energy practice at US law firm Akin Gump and former AWEA president. Early this year, developers were pinning down final orders for the most cutting-edge turbines, yet were wary of buying too much equipment because of next year's likely downturn. An increase in mergers and acquisitions, especially amongst smaller developers, is expected later this year. Wind-sector job losses are projected to continue rising, especially from late summer. In January, Vestas warned that if the PTC expires it will axe more than half its American workforce - some 1,600 jobs. Vestas has invested more than $1 billion in the US in recent years, mostly in four factories in Colorado. Although other major turbine manufacturers are not expected to make as many redundancies, AWEA has estimated that the number of US wind jobs will be almost halved if the PTC expires, from a current workforce of 78,000 down to 41,000 in 2013. In response to the poor and uncertain outlook that is facing the US wind market, those players that have the option have been seeking to diversify, either by focusing on wind opportunities beyond the US or by developing solar and other renewable activities. GE's wind strategy prioritises globalisation. "We're going north, south, east and west - including into Brazil, Canada, Europe and Asia," says Vic Abate, GE vice-president for renewables. 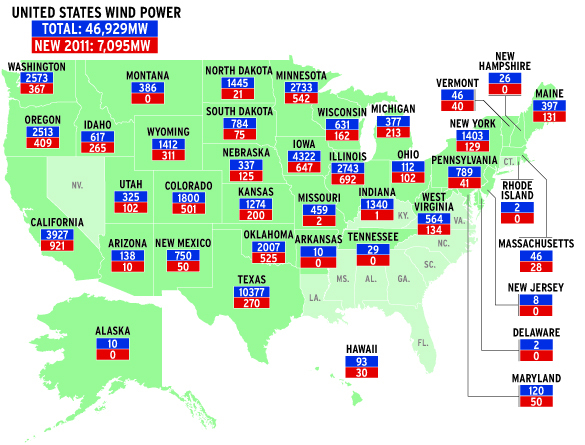 Last year, more than half of the manufacturer's wind turbine orders were for outside the US. Without the PTC, the US share of GE turbine sales will continue to shrink, according to Abate. In January, the company also announced its first hybrid sale of thin-film solar panels to a US wind customer, Invenergy, for an installation adjacent to a wind project. Meanwhile, the country's largest wind developer, NextEra Energy, has not included any new wind projects in its plans for 2013. Another company targeting international markets is EDP Renewables (EDPR). The manufacturer has not allocated any capital to US wind development for 2013. "It's going somewhere else," confirms EDPR North American chief executive Gabriel Alonso. "It's not going to the US." Alonso adds that solar is of greater interest because its ITC does not expire until 2016. EDPR laid off 10% of its US wind workforce last autumn and has shifted its focus to operating and maintaining its 4GW of North American wind projects. Mid-sized developer Cielo Wind Power has also reassessed its prospects. "We're doing a whole lot of soul-searching in terms of our strategy," explains chief executive Jan Paulin. "We need to recast ourselves somewhat." According to Paulin, 2012 will be worse than 2008-9, when financing evaporated due to recession. Subsequent federal-government economic-stimulus funding granted wind developers access to Section 1603 grants, which ended in December 2011. In mid-February, a PTC extension failed to make it into legislation to renew a payroll tax cut and jobless benefits. Analysts expect Congress instead to pass an extension after November's presidential and congressional elections, a time when lawmakers traditionally turn their attention to wrapping up legislation before the holidays. Even so, analysts predict that the size of the credit might end up being reduced from the current 2.2 cents/kWh. Also, the extension might only be for one to two years, as has been the case previously when the PTC expired, rather than for the four years requested by wind lobbyists. BNEF's Grace said in early February that the odds were 70% to 80% for passage of a one-to-two year PTC extension after the elections. Make's Shreve similarly saw a "better than 70% chance of a short-term extension of the PTC" after the 6 November vote. Few analysts expected the investment tax credit to survive. In late January, President Barack Obama publicly lent his support to extending wind energy tax credits. "I will not cede the wind or solar or battery industry to China or Germany because we refuse to make the same commitment here," he said in his much-watched annual State of the Union address. Obama's words presage a fierce political fight over renewables expected during 2012's election campaigning. And in February Obama's proposed budget included a reinstatement of Section 1603 grants. Despite Obama's views, US policymakers appear unlikely to act on a renewable-energy or clean-energy standard this year. This is due to too little vision on the part of both political leaders and renewable-energy lobbyists overly fixated on tax credits, argue critics. "The industry has been lobbying heavily for the PTC for 15 years, and (the situation) does not seem to change. There's not enough creativity. It's the same old, same old," says Paulin. Applications to the federal loan-guarantee programme, administered by the US Department of Energy, closed on 30 September 2011, with Cape Wind's 468MW offshore project missing the deadline. Other projects secured loans, including the 845MW Shepherds Flat wind farm, which clinched 80% debt financing. Less pleasing was one of the US renewables sector's most pivotal events of last year, the Solyndra scandal. The bankrupt solar company had been awarded a $535-million loan guarantee by the Obama administration, based on what critics say was political favouritism. The controversy will be used to discredit renewable energy, says Make's Shreve. On a positive note, US offshore wind inched closer to deployment with the federal government's launch of a plan to encourage 10GW of capacity by 2020 and 54GW by 2030. Another piece of good news was the Californian renewable energy standard, legislation that ups the state's renewables contribution to electricity generation from one-fifth to an historic 33% by 2020. The trade war between the US and Asian manufacturers continued, with four US wind-tower makers accusing Chinese and Vietnamese companies of dumping towers on the US market. Hefty duties could be imposed, possibly in early 2013, if the US government ultimately agrees with the allegation. China ended one of its wind equipment subsidies in 2011, following a complaint by the US Trade Representative prompted by the United Steelworkers trade union. In a legal fight that has become a proxy for America's trade war with China, Massachusetts-based developer AMSC sued its previous customer Sinovel, China's largest turbine manufacturer, over stolen intellectual property. In Austria, a former AMSC employee, who claimed he sold information to Sinovel, was convicted and imprisoned. Sinovel denies the charges and has counter-sued citing breach of contract. On a less controversial front, US turbine prices dropped steadily to $1.27 million per megawatt for delivery in the first half of 2011 from a peak of $1.84 in the first half of 2009, according to Bloomberg NEF. More sophisticated technology, such as longer blades, along with more US component manufacturing and downward recessionary pressure has helped slash wind costs by half in just five years, a trend that may or may not be maintained. Towards the end of 2011, some utilities gauged that wind prices might have bottomed out, leading to greater availability of new power purchase agreements, says Zaelke. However, the fall in the cost of wind energy was offset to a significant extent by a greater drop in overall electricity prices. By mid-January 2012, natural-gas futures on the New York Mercantile Exchange had slumped to just $2.47 per million British thermal units. Given that gas prices could fall further still, thanks to increasing shale production, America's wind industry may be facing a more competitive market than ever before. "If you've only got half an eye on the game, it's not the time to be in this business," warns Zaelke.